Fire-King - Really Hot Stuff! When I drop by the homestead with my family for a lunch or a casual dinner visit with my parents, more often than not my dear mom still serves up a main dish in a Fire-King casserole. If one glances over toward the counter more often than not there sits a Fire-King eight inch Swirl mixing bowl ready to be washed up until next mealtime. These kitchen items have been a fixture in mom’s kitchen for the past forty-odd years and still do a fine job. Quite recently I was at a Depression Glass Show with my mother-in-law when she spotted a certain Fire-King bowl on one of the dealer’s tables. He seemed rather pleased that she appeared to take a fancy to one of his better pieces of Fire-King. His jaw dropped considerably when she informed the dealer “When Walt comes over I always serve potato chips in an identical bowl.” One of the joys of Fire-King glassware is the fact that this is glass that so many of us can readily remember having, or perhaps are still using in our own kitchens. The Hocking Glass Company set up business in Lancaster, Ohio in 1905. Originally they produced mainly small hand made wares. By the 1920’s, Hocking was able to advertise “tableware, plain and decorated; tumblers, jellies, lamp chimneys and lantern globes, opal ware, specialties and novelties.” This period also saw them pioneer the manufacture of glass baby food jars and disposable beer bottles. 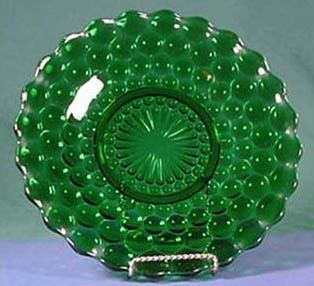 Through the 1930’s, the Hocking Glass Company was a major producer of what we today call Depression Glass. The company was noted for their manufacture of a wide variety of coloured glasswares in amber, blue, canary, green, pink and Vitrock (the company’s name for opaque white). 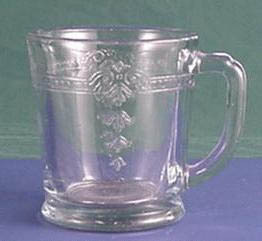 Many of the most popular Depression Glass tablewares, what collectors dub the Adam through Windsor patterns, were produced by Hocking: Block Optic, Cameo, Colonial “Knife and Fork”, Coronation, Fortune, Hobnail, Mayfair “Open Rose”, Miss America, Old Cafe, Old Colony “Open Lace”, Oyster and Pearl, and Princess. In addition to their tablewares, Hocking also was a prolific producer of kitchen wares: reamers, bowls, canisters, fridge jars, cookie jars, water bottles, shakers, and many other useful items. As the Hocking Glass Company grew it absorbed various other firms — Lancaster Glass Company, Standard Glass Company, and Monongah Glass Company. However, the most significant change in the company’s history came in 1937 when it merged with the large container manufacturer Anchor Cap and Closure Corporation of Long Island City, New York. What emerged was the Anchor Hocking Glass Corporation, the creators of Fire-King glassware. In 1942, Anchor Hocking started to market a new formula of heat proof glassware, Fire-King. The composition of this oven-proof formula glass is called “borosilicate”. Such was its durability that they were able to guarantee it for two years against breakage due to heat. Often times one finds collectors rather put off by the in-depth knowledge that one must possess to recognize an authentic antique or collectible item. The newly formed Anchor Hocking settled that matter. With the vast majority of Fire-King lines this is not a problem — approximately ninety percent of their items are clearly marked on the bottom “Fire-King”; between 1942 and 1945 the items were simply marked “Fire-King” from the mid 1940’s to 1960 one finds “OVEN-FIRE-KING” or a variant mark; from 1960 to the late 1970’s “ANCHOR HOCKING” was added with the most involved mark reading “ANCHOR HOCKING-OVEN-Fire-King-Suburbia-OVEN-PROOF-MADE IN USA.” Occasionally numbers are also found along with the trademarks. These are mold numbers indicating molds that were damaged during the production process and had been subsequently reworked. On Fire-King glass that was not trademarked there would have been a label attached with identification. One still does come across the odd piece with original labelling. 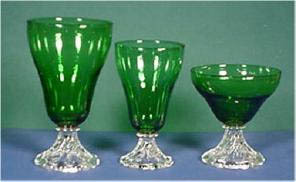 Continuing their tradition from the 1930’s, Anchor Hocking still produced a wide palette of glass colours: Azurite, Forest Green, Ivory, Jade-ite [an opaque green], peach lustre [trade name for a golden fired on colour], Royal Ruby, Sapphire Blue, Turquoise Blue, White, and fired on colours [colours fired over a white base], and patterns on white glass. The clean lines of Fire-King glass and its reasonable costs made it a hit with numerous commercial enterprises. Just as in the depression era many companies from the 1940’s through the 1970’s continued to give premiums with their products. Anchor Hocking provided mainly bowls and mugs in white opaque glass to their many commercial clients. These items were given away in the hundreds of thousands with applied logos of the companies adorning the glassware. Such large companies as Burger Queen, Esso, Pillsbury, and McDonald’s all gave away Fire-King items. The Ohio Cloverleaf Dairy packaged some of their cottage cheese in bowls with tin lids. Sacks of Town Crier flour each contained an item of Jane Ray tableware. In packages of Mother’s Oats you’d receive a piece of Copper Tint kitchenware. In addition you might find Fire-King that was given away by banks and railroads or used as souvenirs of towns, schools, and golf tourneys. Some mugs and cereal bowls were also decorated with various cartoon characters such as Snoopy, B.C., Strawberry Shortcake, Batman and Robin. Institutions such as hospitals, churches, diners and school cafeterias often bought Anchor Hocking’s Fire-King Restaurant Ware for their high usage needs. 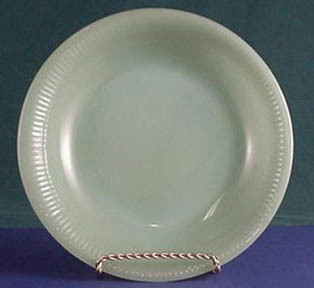 The production of this plain unadorned heavy-weight glassware, mainly in jade-ite [an opaque light green colour] lasted from 1948 through to 1974, while its white lines were produced mainly in the 1960’s. Through the 1970’s the line was expanded by decorating the white wares with half a dozen different coloured decorations. Once in a delightful while, one might yet be fortunate enough to stumble upon a small diner still serving meals on their vintage set of jade-ite Restaurant Ware. Fire-King is good utilitarian glassware. The company aimed to market not only for commercial, institutional and the restaurant markets, but also for both the home kitchen and table as well. For the cook in the house Fire-King was great. Nesting bowl sets, salt & pepper shakers, grease jars [ either with glass or screw-on tin lids], batter bowls, fridge containers [square & rectangular], casseroles, cake pans, custard cups, loaf pans, pie plates, measuring cups, hot plates, flower pots, and milk pitchers were produced in numerous lines. Many of these items were undecorated such as the highly popular Swirl mixing bowls, the Swedish Modern [teardrop shaped] bowls, and the straight-sided Splash Proof mixing bowls. Although largely gone from today’s kitchens, Anchor Hocking also produced “range sets” — consisting of a grease jar, salt and pepper shakers, and a set of three nesting mixing bowls. Also largely missing from our present-day kitchens are the batter bowls, handled spouted bowls, that were made for numerous Fire-King lines. From 1942-48 another large line of kitchen wares was created in a clear blue colour and called Sapphire Blue Ovenware. Unlike most other kitchen wares this line has an embossed design on the sides called Philbe, after the designer Phil Bee. Starting in the early 1950’s, a number of decorated kitchenware sets started to be marketed under the Fire-King name. Amongst the most popular are the Black Dots, Red Dots, Tulips, and Apple patterns. From the late 1950’s through to the mid-1960’s Gay-Fad Studios of Lancaster, Ohio ordered large quantities of Anchorwhite glassware bowls, casseroles, mugs, cake pans, custards, cream and sugars, and refrigerator jars. On these white shapes they hand-painted various designs of fruits and flowers, such as pink dogwood and mixed fruit. Though quite lovely, these hand-painted items are difficult to find in excellent condition since the paint easily scraped and faded in heavy kitchen usage. 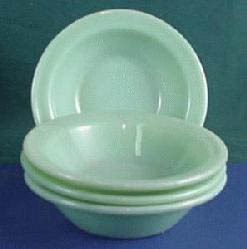 Amongst the popular tableware lines marketed as Fire-King appears Jane Ray, manufactured between 1945 and 1963. This pattern simply has an edging of ridges on each piece. Though mainly produced in jade-ite, some ivory Jane Ray also was produced. This table ware line consists of bowls [dessert, oatmeal, soup plate, vegetable], bread and butter plates, salad plates, dinner plates, platters, cup/saucer sets, cream/sugar sets, and demitasses. Another of the most widely recognized patterns was Bubble, which was produced in various forms from 1948 through to 1968. Although sapphire blue Bubble is the most common it was also produced in shorter lines in clear, forest green, ruby, iridescent, jade-ite, lustre, white, and pink. Besides the plainer patterns, as in the kitchen lines, table wares were also produced with decoration — such as the Primrose, Honeysuckle, Sheaf of Wheat and Game Birds patterns. The Game Birds pattern featured four different wildlife decorations: Mallard Ducks, Canada Geese, Ring-neck Pheasants, and Ruffled Grouse. In all there were some three dozen different dinnerware lines that Anchor Hocking manufactured under the Fire-King trade name. The sources of information on Fire-King glassware continue to expand. The first book to do a full-scale overview was Anchor Hocking’s Fire-King Glassware published by Garry and Dale Kilgo, and Jerry and Gail Wilkins in 1991. Now in its second edition, these Alabamians produced a fully illustrated and colour packed volume. With its all inclusiveness and historical research it continues to be arguably the best book on Fire-King also jumping on the bandwagon was the prolific producer of Depression Glass books Gene Florence. With more pictures than the majority of his volumes this book is a useful addition for Fire-King collectors. Kilgo and Wilkins also publish The Fire-King News, a quarterly Newsletter about Fire-King. With research still in its early years on this glassware new finds and rare items continue to pop up making their Newsletter a good resource. Fire-King has taken flight and popularity, and in some instances in prices. It is an exciting time to be a Fire-King collector with items still fairly easy to come by and new items being found year by year. Whether you support or curse Martha Stewart, her use of Fire-King in her famous kitchen, with mixing bowls and cupboards chock full of Restaurant Ware and Jane Ray, she has helped raise the profile of this very collectible glassware. Fire King has definitely arrived as the latest generation of glass collectible!